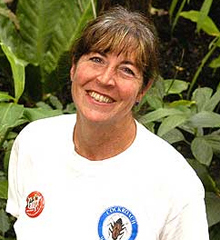 Dr. Greig is a botanist and entomologist, with a specialty in the interaction between insects, especially butterflies, and plants. She can speak knowledgeably on a variety of subjects, such as butterflies and butterfly gardening, the monarch butterfly migration, pollinating insects, insects in general, tropical plants and their adaptations, and plant ecology in general. Dr. Greig has a B.A. in linguistics, and a Ph.D. in biological sciences, both from the University of Texas, Austin. She has worked at HMNS since 1994 and has served as an adjunct assistant professor of ecology and environmental biology at Rice University since 1998. She is fluent in English and Spanish.